It took Windel a few minutes to be able to stand up after he was rescued, but remarkably, he survived his tumble down a 30-foot ravine with barely a scratch. It was Feb. 8, and Ray McCrillis was getting nervous. He and his wife’s 12-year-old dog, Wendell, had been missing from their home near Silverthorne for two days, which was very unlike him. McCrillis had driven all around town and put up missing posters, but the only calls he had gotten were from neighbors concerned about the Labradoodle with salt-and-pepper fur, a celebrity of sorts in their cul de sac on Shooting Star Way. Bev McCrillis was out of the country, and Ray, who hadn’t wanted to put a damper on her trip by telling her, had an important doctor’s appointment in Denver. He had no choice but to temporarily suspend his search. Luckily, one of Wendell’s neighborhood pals, a dog named Ivy, picked up where Ray left off. Ivy was on a walk with her owner, Susan, who lived two doors down, when she started barking at a tall snowbank on the side of the road. A little confused, Susan peered over it and down into the ravine some 30 feet below. Sure enough, there was Wendell, curled up in a ball and hopelessly stuck in the deep snow. 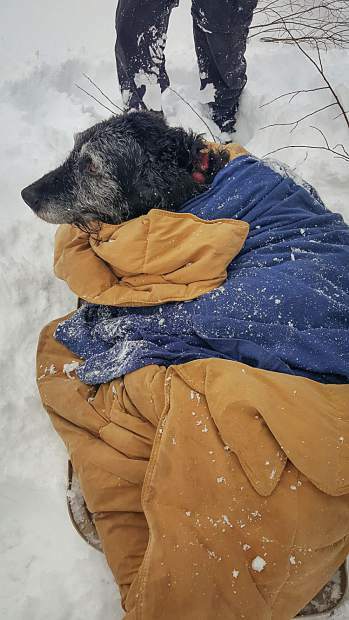 There was still the question of how to get Wendell out: He’d been shivering through temperatures in the low teens and could barely move, and carrying a fully grown Lab out of a steep, snowed-in gully would be no easy task. Susan called Summit County Animal Control, which got to work assembling gear: an animal stretcher, some climbing ropes and anchoring materials. By the time they got there, Susan and four other neighbors were already down in the ravine trying to build stairs in the snow so they could carry Wendell up. Animal Control workers tied some climbing rope to nearby trees and lowered the stretcher down into the ravine, where the neighbors bundled up the shivering Wendell and secured him in its straps. Once Wendell had been pulled out, the impromptu rescue group quickly loaded him into a van bound for a veterinarian. It took him several minutes to be able to stand up again, but remarkably, Wendell survived his ordeal in the ravine with barely a scratch. Apparently, Bev said, Wendell had been eating snow and had even dug himself a little cave of sorts to shelter from the wind and cold. As for whether or not he learned his lesson, that’s unclear.